From the masterful David Almond comes a joyful, wistful story of boyhood, running, and tales of days gone by, in a beautiful gift edition illustrated in full color. Liam just wants to go out running with his mates—the Junior Great North Run is not far away, and there’s training to be done. But Mam needs him today, to help old Harry clear out his house. And Harry knows a thing or two about running. When he was a lad, he says, he ran from Newcastle to South Shields. “But Harry,” says Mam, “it’s thirteen miles!” Harry grins. “Different days,” he says. Here is the story of that day: of sweltering heat, clattering boots, briny sea air, and the heavenly taste of ice cream; the day when Harry and his pals ran and ran and ran through the blazing sunlight all the way to the sea. David Almond has received several major awards, including a Hans Christian Andersen Award, a Carnegie Medal, two Whitbread Awards, an Eleanor Farjeon Award, and a Michael L. Printz Award. He is known worldwide as the author of Skellig, Clay, and many other plays, stories, and novels, including The Boy Who Swam with Piranhas, illustrated by Oliver Jeffers; The Savage, Slog’s Dad, and Mouse Bird Snake Wolf, all illustrated by Dave McKean; and My Dad’s a Birdman and The Boy Who Climbed Into the Moon, both illustrated by Polly Dunbar. David Almond lives in England. Salvatore Rubbino is a graduate of the Royal College of Art in London. He is the creator of many acclaimed picture books, including A Walk in New York and A Walk in Paris. He lives in London. In a moving and exuberantly illustrated short story, 11-year-old Liam has entered the Junior Great North Run...Narrated in the working-class British dialect common to several of Almond’s books, the story may require parental translation in places, yet it’s near impossible to remain untouched by Harry’s tale. Rubbino’s airy full-color pictures, splashed across the pages, reveal that the frail, elderly Harry lived a life every bit as full of action, fun, and pleasure as Liam’s. Harry's valedictory "Me great achievement is that I've been happy, that I've never been nowt but happy," is a win in itself. Rubbino's loosely brushed watercolors expertly capture both the tale's period and its high spirits, rendering the present-day story in a gray wash and Harry's reminiscence in full color...A rich and resonant short story. Rubbino’s lively watercolor illustrations enhance the tale’s warmth and contrasts, depicting Harry’s vivid recollections in bright colors and current happenings in a gray wash. Once again, Almond’s masterly evocation of place, time, relationships, and indomitable spirit is superb. An excellent addition to middle grade fiction collections. This intergenerational story sweetly captures the importance of memory and shows how the yearning for fun and adventure never really changes. In Salvatore Rubbino’s lovely, lively brush strokes, we see the great adventure...Like Liam, readers ages 8-11 are likely to leave their encounter with Harry both heartened and happy. His sweet story is crafted into an elegant tale with a touch of magic in Almond’s quietly compelling, dialect-rich prose. Rubbino’s summer-hued watercolor, gouache, pencil and ink illustrations echo the naïve style and energy of Quentin Blake...this lovely illustrated take tugs gently at the nostalgic threads many children experience as they enter puberty, knowing that they are losing something precious that is worth holding on to in memory. 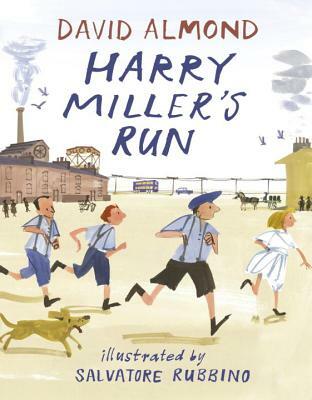 Absolutely first-rate, Harry Miller’s Run is perfectly executed in every way, washing over readers in unexpected ways that will provoke deep reflection about compassion and what life is really all about.